Two garden features we love are the pergola, which functions as an outdoor dining space, and the raised bed that we assembled from a kit for growing vegetables (dog-proof!). Our ex-gardener (we no longer needed his services after we remodeled) laid the flagstone on sand, with some planting soil on top so we could plant wooly thyme in between (note: some types of sand are not compatible with planting). We put a round tile-topped table with four chairs underneath the pergola. The roses were preserved to provide green “walls” with lovely flowers spring through fall, and grape vines quickly grew to start filling in the top. We’ve spent many a pleasant day since then having breakfast, lunch or dinner under the grape vines! We needed a space safe from our lovely greyhounds for growing edibles. Maui and Zippo love to race around the backyard, which resulted in removal of the raggedy lawn we inherited with the house. 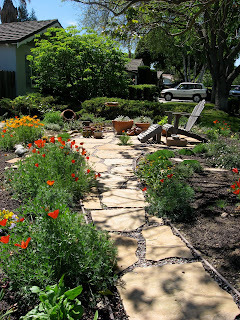 They did us a favor and jump-started our backyard remodel, which included getting rid of water-wasting lawns, planting native and low water plants, and spaces for growing vegetables and herbs. We also added some young fruit trees and blueberry bushes. We liked that they are a mom 'n pop company, and that it would not have to ship too far (from San Diego to SF Bay Area). It came with wire mesh to lay down to foil gophers, and also with a watering system. It also has a cute gate, to keep out the pooches. We got the 20 inch high beds to minimize back strain while planting. The beds have herbs planted around them, and they have provided fresh food year round. We are in our second winter with the beds, experimenting with what grows best and tolerates our frost, and we look forward to our third spring and summer coming up! By the way, we use no pesticides, and we are committed to keeping our yards free of that stuff- besides, we have found it's really not necessary. 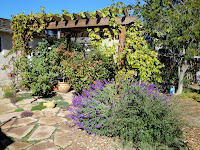 Common Ground, our local organic gardening center in Palo Alto, provided lots of inspiration and resources. About a year and a half ago we finally started transforming our front and back yards from lawn dominant to low water, native and Mediterranean climate type of plants. 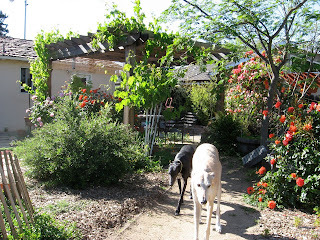 Another focus was creating spaces for edible plants that were safe from our much loved greyhounds. Here are views of our lawnless front yard, which now has a planting bed for edibles and flowers (above) , and the other side of the front yard (below) is planted predominately with herbs and native plants. 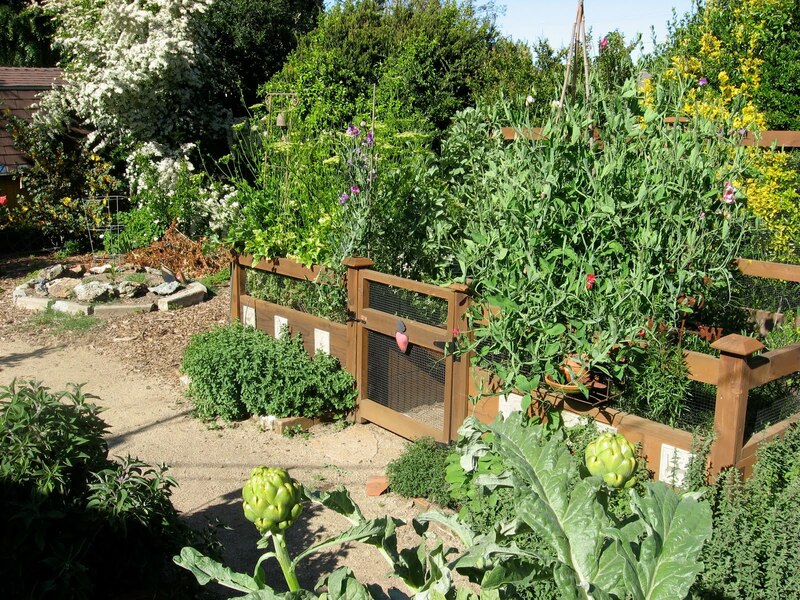 We feel fortunate to live on the San Francisco Peninsula, where even though it's definitely urban, there is so much natural bounty to enjoy: backyard wildlife, gardens of various types, and easy access to locally produced food of an enormous variety. And the climate, of course, is fantastic for growing food, from vegetables and herbs, to fruit. 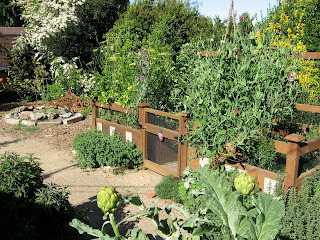 On these pages I'd like to share our experience turning our traditionally landscaped gardens into prolific kitchen gardens and as a bonus, creating habitat for the numerous birds, bees, lizards and other wildlife that naturally inhabits our area. I'll tell you about our favorite resources and lessons learned, and I hope to hear about yours in turn. "When we bought our home in 2001, we inherited traditional ornamental landscaping in the front and backyards, including over 20 rose bushes. We have gradually redesigned the yards with fruit trees, vegetable and herb beds, and native and drought tolerant plants. We both grew up in households where cooking with fresh basic ingredients was the norm (Thierry immigrated from Belgium, and Patricia from Chile), and we enjoy growing a variety of vegetables and herbs organically for daily use year round. Our love of nature and a desire to maintain a thriving habitat for wildlife of all types, has also been a factor in our approach to landscaping, therefore we do not use chemical herbicides, pesticides or fertilizers. 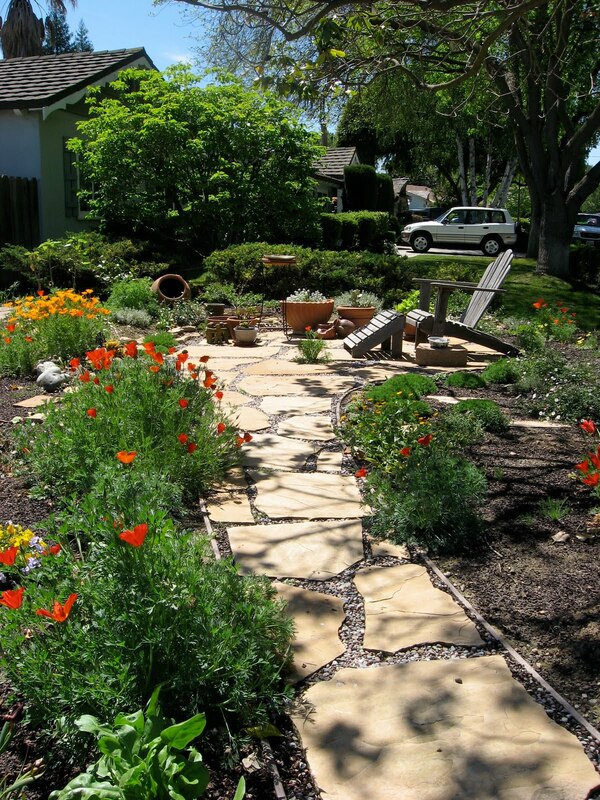 Initially we consulted with two different landscape design firms, but ultimately decided to create our own plans. Our gardener and his crew worked with us to implement our vision by doing the preparation, drip systems, installing flagstone and crushed granite paths, and building the planter in the front yard. Thierry put his computer skills to use by drawing up the designs using Google Sketchup which provided detailed plans for the workers. We researched, acquired, and planted all of the plants, and we consider our gardens works in progress, as we make new discoveries on our favorite edibles. 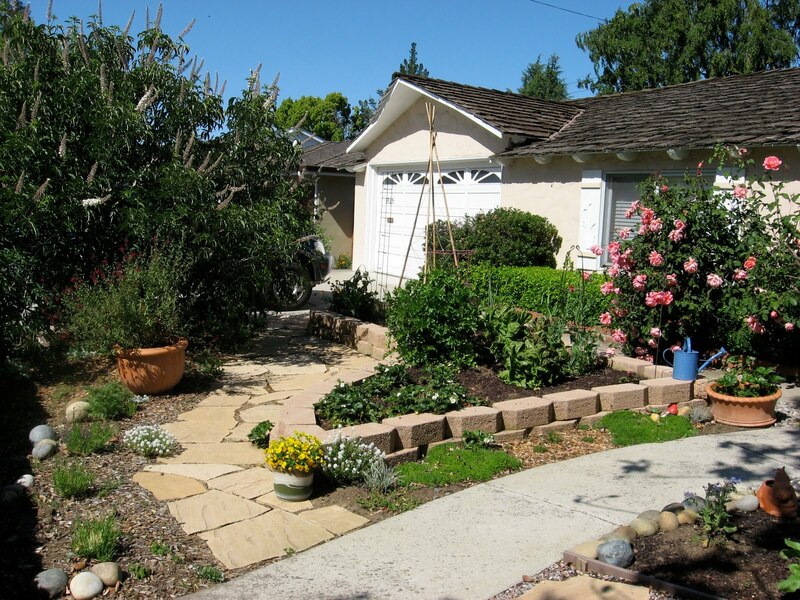 The front yard features a large and very productive Meyer Lemon tree and a thriving ten year-old avocado tree nurtured from a sprouted pit from the compost pile. 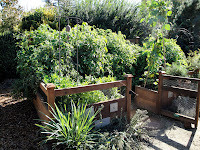 A planting bed constructed from “green” materials provides additional space for seasonal edibles, including a kumquat tree as a centerpiece. A spectacular stand of Matilija Poppy, and other natives have replaced a side lawn along the driveway. We eliminated all of the lawn in the backyard (above) with the help of our two beloved greyhounds, and redesigned the yard so that it is compatible with four-legged family members while providing spaces for vegetable gardening, wildlife habitat, and an outdoor dining area under the pergola. 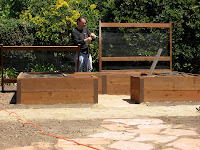 A key feature is the raised bed planting unit we built from a ready made kit which includes a watering system, trellis, and a gate to keep the edibles safe from curious canines (below). Young apple and pomegranate trees have been planted, as well as herbs for the kitchen. 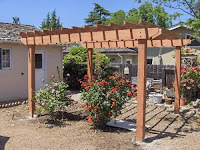 The pergola is framed by grapevines and is the perfect spot to enjoy the diversity of birds that share the garden. The shrubbery along the backyard fence was preserved as nesting habitat for them. An organically maintained rose garden supplies food for the soul (blueberry bushes have replaced some of the roses)."